Established in 2015, Colorado Hemp Honey comes straight from Frangiosa Farms in the heart of Colorado. Specializing in raw honey products infused with CBD-rich hemp oil, Colorado Hemp Honey is dedicated to enriching your health while supporting the environment, local communities, and healthy bee populations. Colorado Hemp Honey gets its raw honey from six apiaries in the Rocky Mountain area. Each hive is raised with the greatest care and attention using purely sustainable, organic practices. For example, every hive is cleaned with essential oils instead of harsh chemicals that could affect the bees’ health and the honey they produce. All of these components add greater flavor and promote more health benefits. Colorado Hemp Honey’s organic practices don’t end with their honey. The brand’s full-spectrum hemp extract that is infused into its products comes from locally sourced hemp farms in Colorado. The company uses a renewable extraction method that preserves vital terpenes and provides you with the full benefits of the entire plant. The hemp extracts are also consistently tested for purity, potency, and efficacy. Colorado Hemp Honey also has its own aromatherapist on staff to handpick essential oils taken from completely natural sources. These essential oils are added to the raw hemp honey to provide a greater depth of flavor and even more layers of better health. Through every step of the process, Colorado Hemp Honey focuses on sustainability and organic ingredients for a purely natural experience. This not only helps the bees and the environment but also gives you a tastier, healthier product. 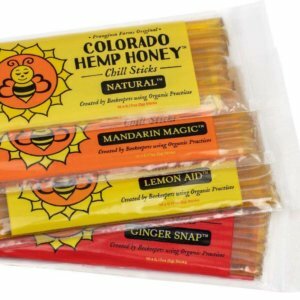 Take a look at our current selection of Colorado Hemp Honey products. If you have questions or need recommendations, please feel free to contact us today.